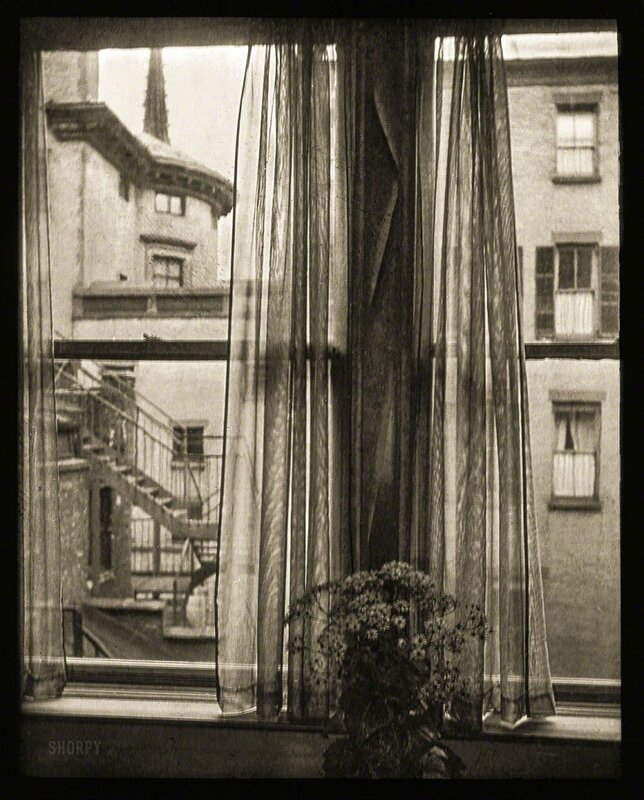 "New York Window." Glass transparency by Margaret Watkins, exhibited at the 2nd International Salon of Pictorial Photography in 1925. View full size. Submitted by Doghouse Riley on Fri, 05/18/2018 - 8:46am. or, add an elevated train track and you've got Elwood Blues'. Submitted by Horace T. Water on Thu, 05/17/2018 - 6:44am. Submitted by OTY on Wed, 05/16/2018 - 3:41pm. This picture is reminiscent of the film "Rear Window" and if you live in NYC (or any big city with buildings arranged like this) you cannot help but see into your neighbors' apartments and lives, especially if they keep their windows uncovered. While visiting relatives in New York for Christmas a few years back, we were unintentionally witnesses to seeing a family directly across the alley from us having their holiday celebration in their beautifully furnished and decorated living quarters since they constantly kept their lights on and their windows uncovered. We made an effort not to look and felt like snoops, but it would be dark there by 4 or 5 and they'd have their place all lit up. I can see how someone who couldn't leave their house would be drawn into the neighbors' business though and it was not a comfortable feeling. Talk about life in a fishbowl. Seemed like a very nice family though. I know it is easy to say "Just don't look over there" but with the placement of the buildings it was really unavoidable. Submitted by indydad on Wed, 05/16/2018 - 3:07pm. Actually, in New York, this would be advertised as a "view apartment." Some people have a view of a brick wall across the air shaft. Actually, this view is kinda picturesque -- almost looks like a European village scene.